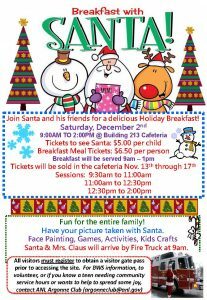 Breakfast with Santa 2017 tickets will be sold in the Cafe Bistro (Bldg. 213) November 13-17 from 11:45-12:30 each day. Please read the following site access requirements and instructions carefully as there have been significant changes made since last year. Following the steps below will allow for an expeditious and safe entry for all authorized visitors of this event. Please use the following link to complete the registration form. Note that the submitted registration form will automatically request a Gate Pass. There is no further action needed. Please only register through this link. Do not use the Gate Pass System. Argonne National Laboratory (ANL) is a controlled access facility and anyone entering the site must be authorized. Employees and Site Occupants must present a valid site access credential upon entry. All visitors 16 years of age and older must be registered and issued a Gate Pass prior to entry. Minors under 16 years of age are not required to register. 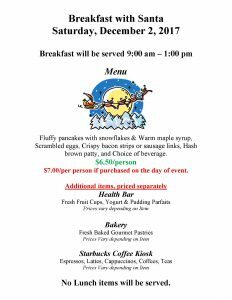 All non-U.S. citizens must register for this event by November 22, 2017. Non-U.S. citizens who have not registered prior to this date will be denied site access. Foreign Nationals who are citizens of Iran, Sudan, or Syria must contact the Foreign Visits and Assignments office at 630-252-1142 prior to registering or purchasing event tickets.